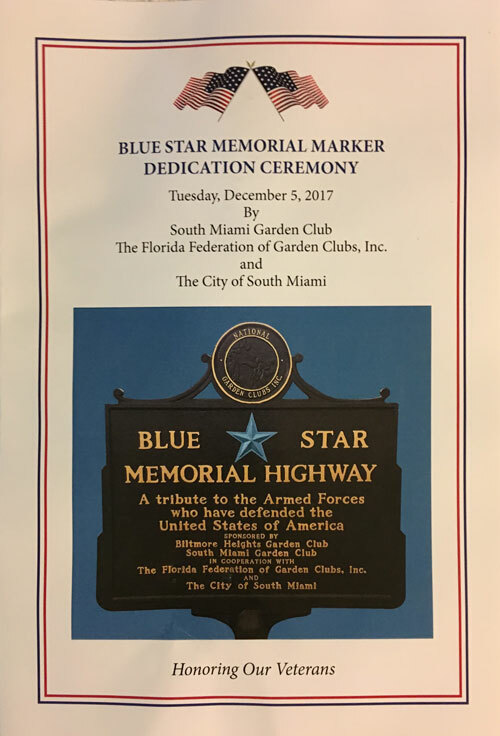 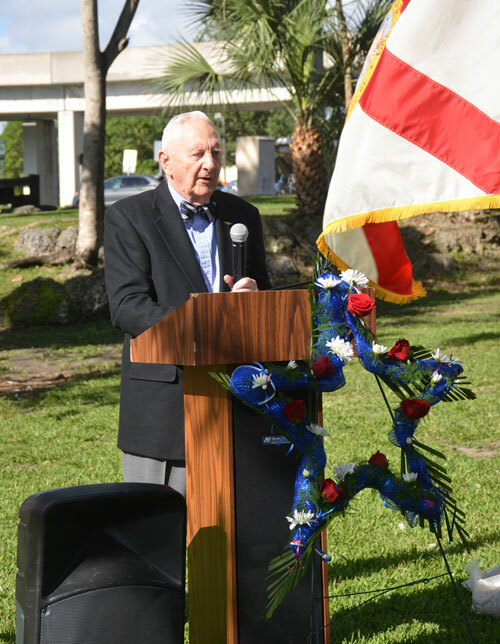 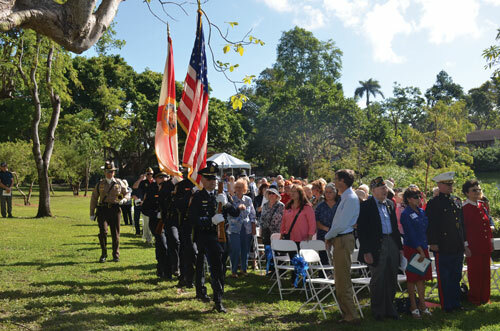 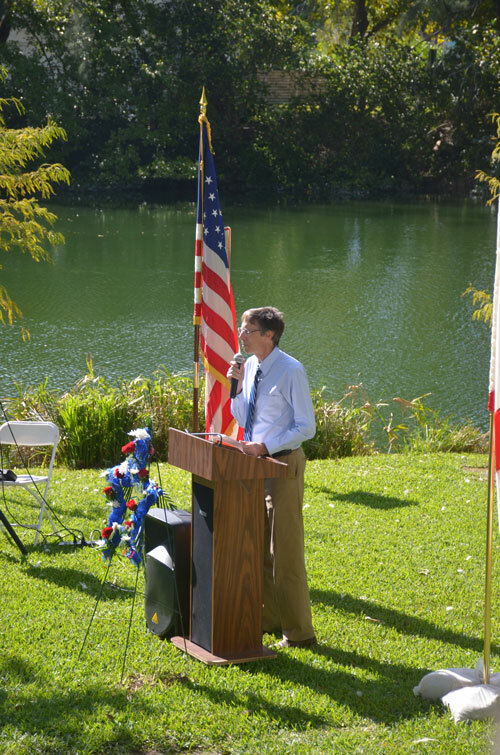 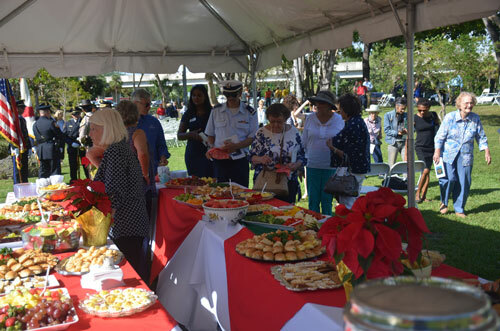 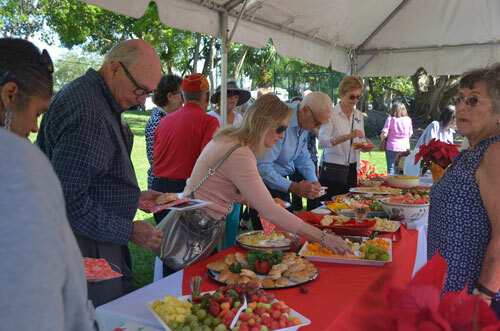 On a bright South Florida December morning, the National Garden Club unveiled a new Blue Star Memorial marker during a ceremony at Fuchs Park in South Miami. 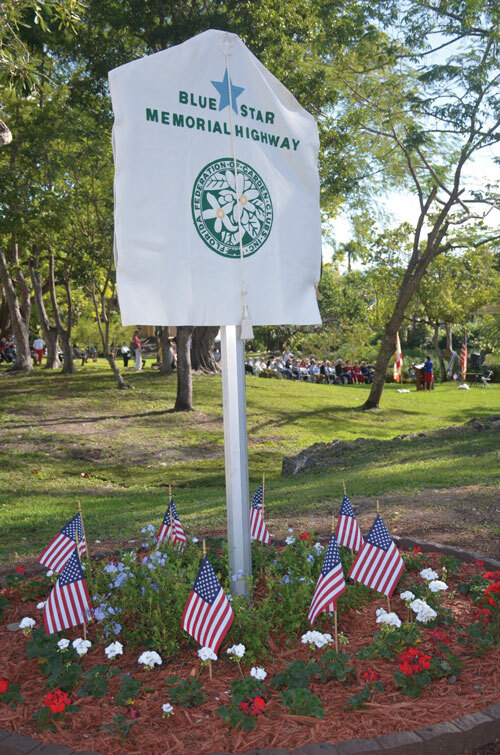 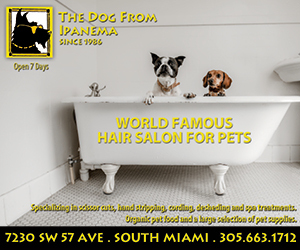 The marker is on a grassy area right outside the park, 6446 SW 81st St., which runs alongside U.S. 1. 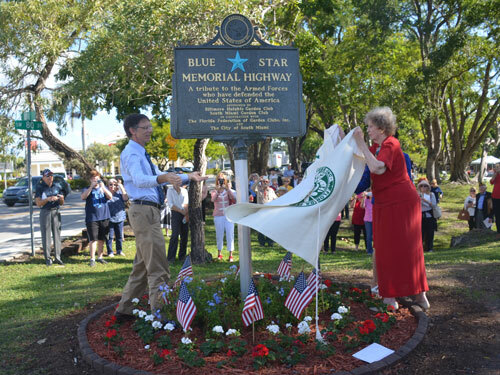 Blue Star Memorial Highways are highways in the United States that honor all men and women that serve in the United States Armed Services. 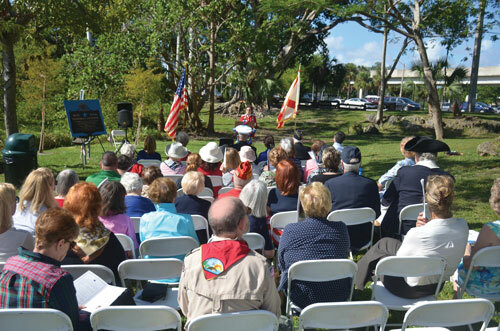 The program began with the planting of 8,000 Dogwood trees by the New Jersey Council of Garden Clubs in 1944 as a living memorial to veterans of World War II. 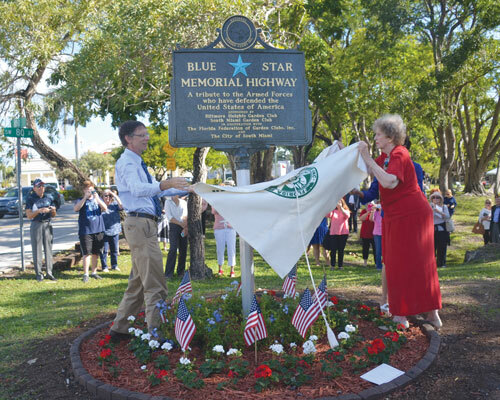 And since 1945, the National Garden Clubs, adopted this program and began a Blue Star Highway system that covers thousands of miles across the continental United States, Alaska, and Hawaii. 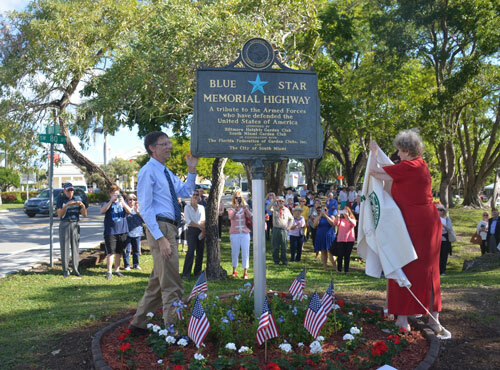 A large metal Blue Star Memorial Highway Marker was placed at appropriate locations along the way. 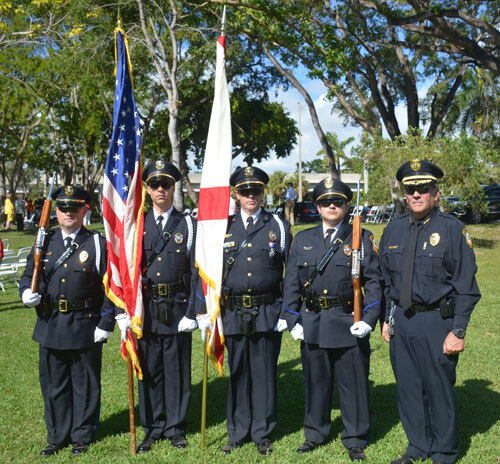 South Miami Honor Guard with Asst. 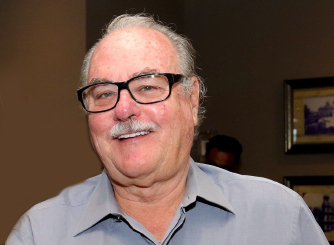 Chief Fata. 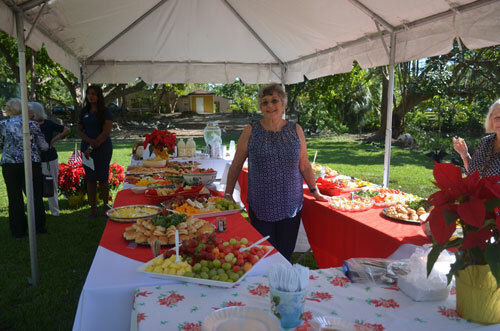 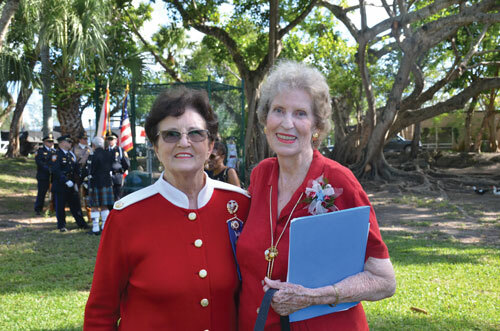 Andrea Little, Chair of the National Garden Clubs Blue Star Memorial and Anna Louise Fulks, program Emcee and President of the South Miami Garden Club. 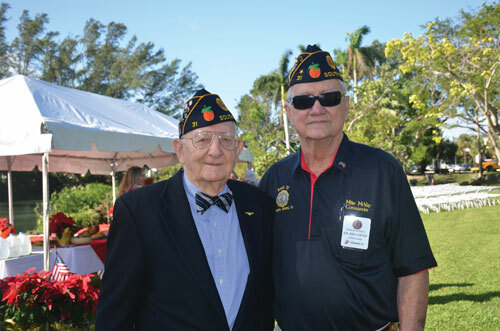 John Waterstreet, WWII vet, and chaplain of the American Legion Post of the Korea and Vietnam Veterans, and Post Commander Mike McVay, Vietnam vet. 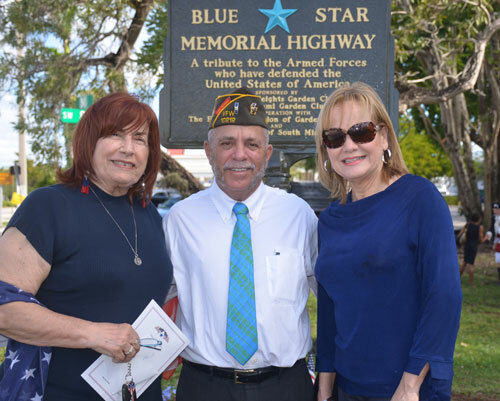 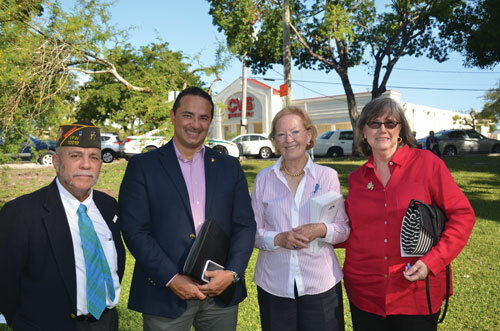 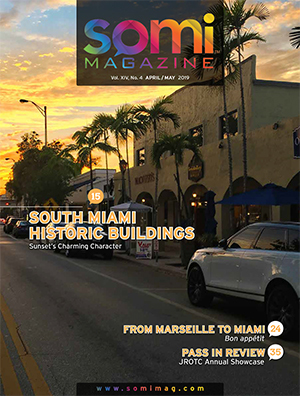 Anthony D. Atwood, Director of the Miami Military Museum & Memorial; Gustavo Cruz, Director, Miami Dade County Military Affairs Committee; garden club event volunteer, and Donna Shelley of SOMI Magazine. 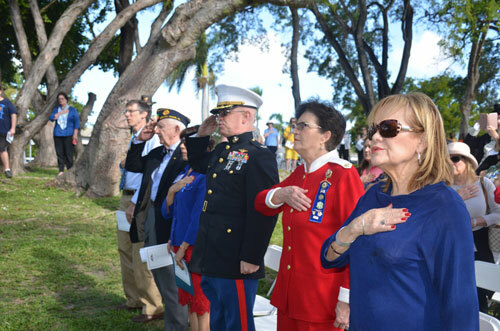 Cristy Arias, Soloist, performing the National Anthem. 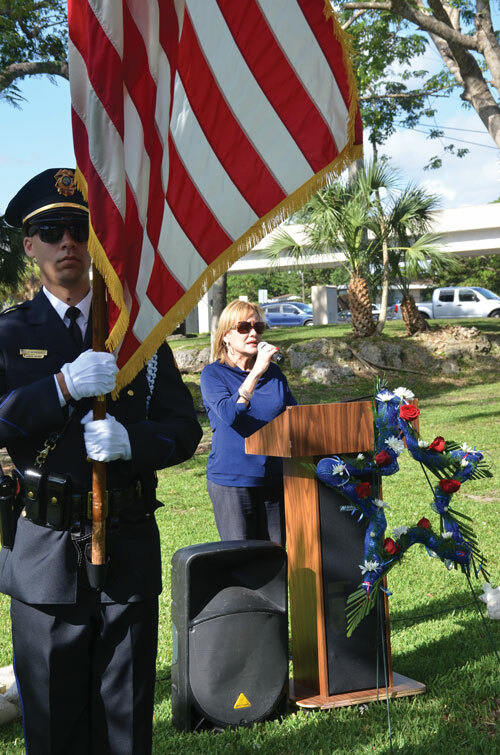 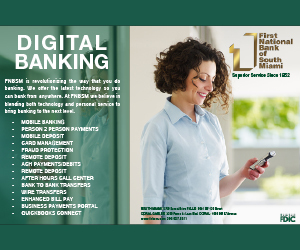 SMPD Asst. 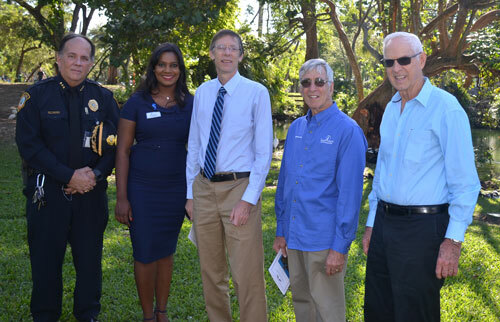 Chief Louis Fata, Brittnie Bassant, ChamberSOUTH President, South Miami Mayor Philip Stoddard, Commissioner Walter Harris and Ron Gold. 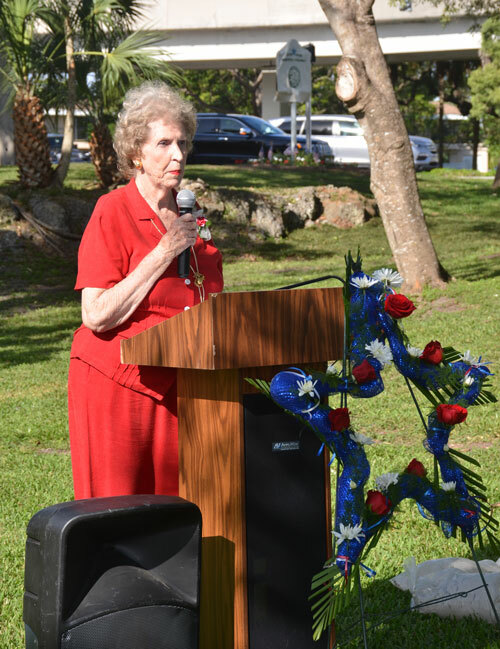 Event organizer and Emcee Anna Louise Fulks welcoming the guests. 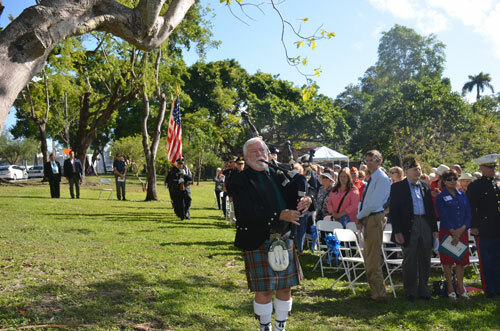 Bagpiper Robert Latimer leads the SMPD Honor Guard to the podium. 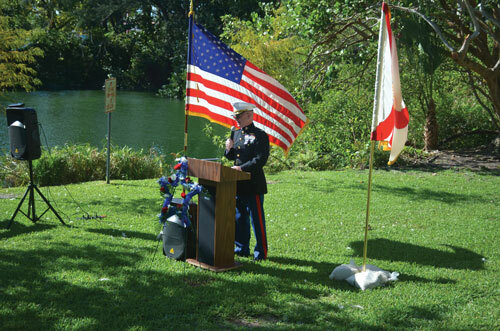 American Legion Post 31 Chaplain John Waterstreet offers the invocation. 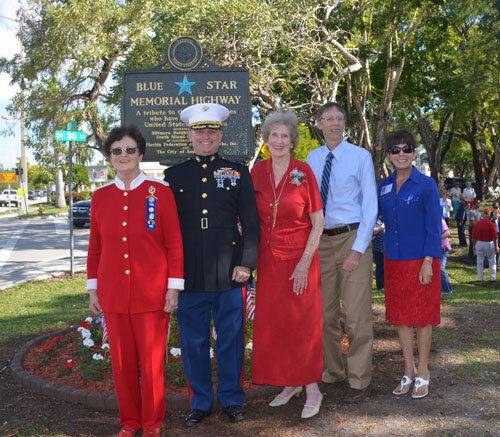 Andrea Little, Col. Michael Ferrell, Anna Louise Fulks, Mayor Stoddard and Rosita Aristoff, Chair, Florida Federation of Garden Clubs. 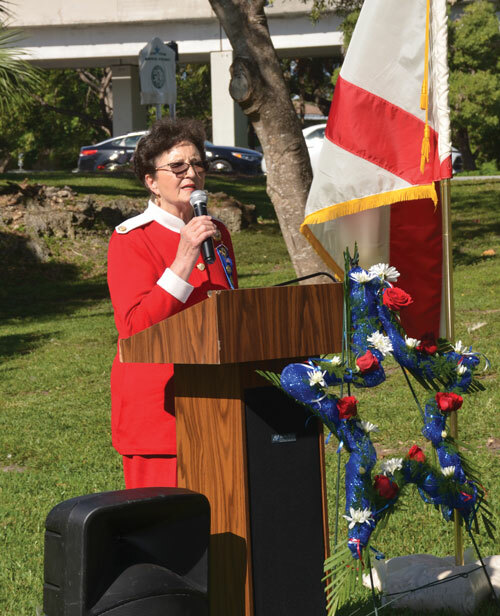 ChamberSOUTH Military Affairs Committee Chair Carmen Layne Powers. 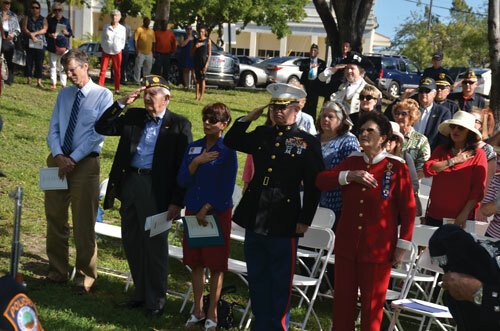 Anthony Atwood and Cristy Arias. 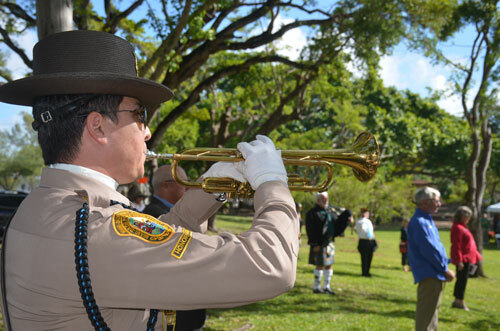 Miami-Dade PD Officer Eduardo Gaitan plays taps at the conclusion of the program. 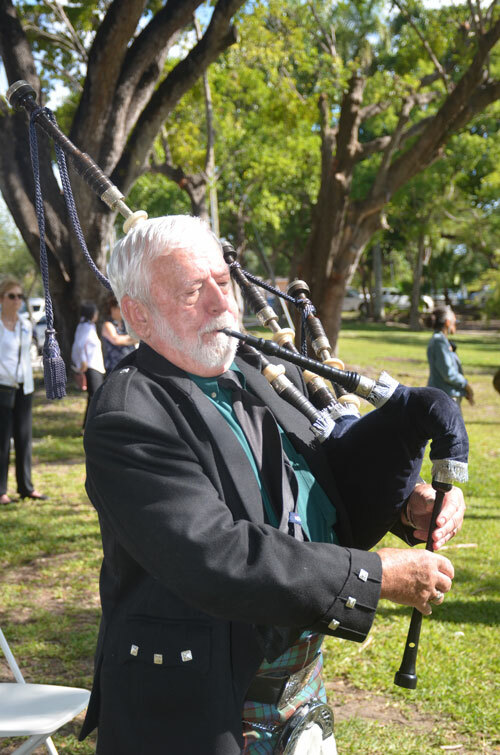 Robert Latimer performs Amazing Grace for the closing.